We should all have such a good hair day. Got the Mathilda bob and the Shock Electric Flexi bob at TuTy’s on Ubanil, and the Rykiel (that’s the crimped style without bangs) at LeLutka. 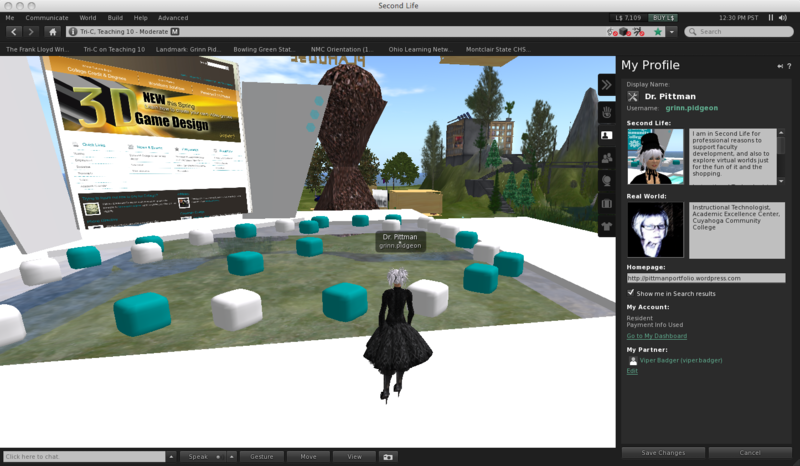 The topic at this week’s Virtual Worlds Education Roundtable (VWER) is “Making the case for avatars: What are the advantages over teleconferencing?” I’ll let you know what comes up, but I have a few thoughts to begin. If you’ve been in a virtual world long enough, you come to understand that there is a physicality to this virtual space. Part of it comes from the sense of presence you gain from walking around as an avatar–and especially from running into objects and other avatars. Part of it comes from building, which gives you that tactile, hands-on sense, even though there are no haptic features that give a sense of touch (yet). I’ve been in enough teleconferences to know that even though I might be seeing and talking to real people in real time, there is something missing. I don’t feel like we are in the same space, even if it is another kind of virtual space. Maybe if everyone at a teleconference had his or her own set of Legos, we could all express a kind of physicality (?). Just thinking out loud. Update 4/22: The gist of the discussion focused on the sense of presence one feels when in world and the effort needed to function there, as opposed to the passive attendance at webinars and teleconferences, where you might be distracted by your desktop or your ability to surf the web while a meeting is going on. Working collaboratively in world, you might be more likely to hang around and chat, whereas after a webinar, or even shortly before it’s over, participants are exiting without so much as a goodbye.